Installed under the sink, the Equinox EQ-25 Undercounter system offered by Vitasalus/Equinox Products is designed to provide years of great-tasting water. This unit is constructed with materials made of 100% recyclable food-grade plastics that comply with FDA guidelines. The EQ-25 effectively reduces chlorine, VOCs, pesticides, bad taste, and odor in all the municipally treated water or water deemed safe by local public health authorities that enters your home, so you can rest assured that your family is getting the highest-quality drinking, bathing, and cleaning water available today. A pre-filter and post-filter are also available for further reduction of particulate present in certain water supplies. Although the EQ-25 Undercounter system is designed to adapt to any existing plumbing, installation by a licensed plumber is recommended. 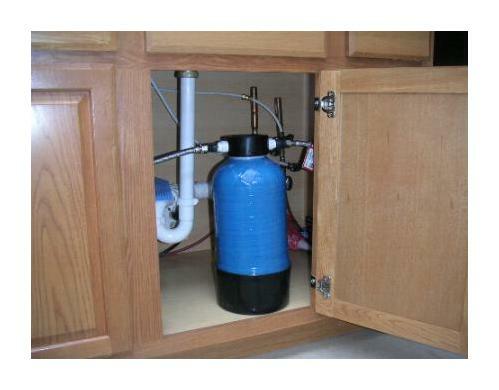 The unit is designed for a 3-5 year or 25,000 gallon life, whichever occurs first. The saturation of the media may occur faster in different areas depending upon the condition of the water. Generally, it is recommended that the unit be replaced when there is a noticeable drop in water pressure and/or return of off-tastes or odors. How may we further help you with your EQ-25?